This week we have the second cameo appearance of that great Chicago player who wore #23. No, not him, but Ryne Sandberg. 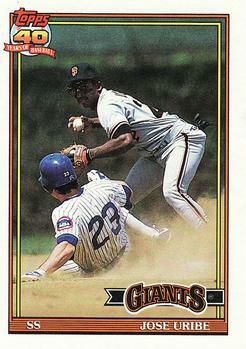 I am fairly confident that GCRL has featured this card on his blog, as he sure does like cards featuring the double play turn at second base. If you haven't checked out his blog, I highly recommend it, especially his O-Pee-Chee side project. The obvious turn at second. Albeit blurry, the outfield ivy of Wrigley Field. The empty bleachers in left field (that seems strange to me!). Uribe is rocking the flip shades and eye black. The black batting gloves flapping in Uribe's left hip pocket. Sandberg has his spikes slightly elevated, just high enough to let Uribe know he is there. If you look real close, Uribe is looking right at you. Not a bad card for a plain old common that is probably passed over 99 times out of 100. Remember, every card has a story and it's waiting on you to tell it.